tldr; both sides wrong in the net neutrality debate. we need to look at networks and interworking differently. otherwise digital and wealth divides will continue and worse. a new way of understanding networks and network theory is called equilibrism. The term “net neutrality” is a contrivance at best and a farcical notion at worst. That’s why both sides can be seen as right and wrong in the debate. Net neutrality was invented in the early 2000s to account for the loss of equal access (which was the basis for how the internet really started) and the failure to address critical interconnection issues in the Telecom Act of 1996 across converging ecosystems of voice, video and data on wired and wireless networks. The reality is that networks are multi-layered (horizontal) and multi-boundaried (vertical) systems. Supply and demand issues in this framework need to be cleared across all of these demarcation points. Sounds complex. It is complex (see here for illustration). Furthermore imbalance in one area exerts pressure in another. Now add to that concept of a single network an element of “inter-networking” and the complexity grows exponentially. The inability for net neutrality to be applied consistently across the framework(s) is its biggest weakness. That's the technology and economic perspective. Now let’s look at the socio-economic and political perspective. Networks are fundamental to everything around and within us; both physical and mental models. They explain markets, theory of the firm, all of our laws, social interaction, even the biology and chemistry of our bodies and the physical laws that govern the universe. Networks reduce risk for the individual actors/elements of the network. And networks exhibit the same tendencies, be they one-way or two-way; real-time or store and forward. These tendencies include value that grows geometrically by the number and nature of transactions/participants and gets captured at the core and top of this framework that is the network, while costs grow more or less linearly (albeit with marginal differences) and are mostly borne at the bottom and edge. The costs can be physical (as in a telecom or cable network) or virtual (as in a social media network, where the cost is higher anxiety or loss of privacy, etc..). To be sustainable and generative*, networks need some conveyance of value from the core and top to the costs at the bottom and edge. I refer to this as equilibrism. Others call it universal service. There is a difference. To understand the difference between universal service and equilibrism into this “natural law of networks” we have to throw in two other immutable, natural outcomes evident everywhere, namely pareto and standard distributions. The former easily show the geometric (or outsized) value capture referred to above. Standard distributions (bell curves) reflect extreme differences in supply and demand at the margin. Once we factor both of these in, we find that networks can never completely tend toward full centralization or full decentralization and be sustainable. So the result is constant push/pull of tradeoffs horizontally in the framework (between core and edge) facilitated by tradeoffs vertically (between upper and lower layers). For example, a switch in layer 3 offsets the cost and complexity of layers 1 and 2 (total mesh vs star). This applies to distance and density and how the upper layers of the stack affect the lower layers. For a given set of demand, supply can either be centralized or distributed (ie cloud vs openfog or MEC; or centralized payment systems like Visa vs blockchain). A lot of people making the case for fully distributed or for fully centralized systems seemingly do not understand these horizontal and vertical tradeoffs. The bottom-line: a network (or series of internetworks) that is fully centralized or decentralized is unsustainable and a network (internetworks) where there is no value/cost (re)balancing is also unsustainable. Much of what we are seeing in today’s centralized or monopolistic “internet” and the resulting call for decentralization (blockchain/crypto) is evidence of these conclusions. The confusion or misunderstanding lies in the fact that the network is nothing without its components or actors, and the individual actors are nothing without the network. Which is more important? Both. Now add back in the “inter-networking” piece and it seems that no simple answer, like net neutrality, solves how we make networks and ecosystems sustainable; especially when supply depreciates rapidly and costs are in near constant state of (relative or absolute) decline and demand is infinite and infinitely diverse. These parameters have always been around (we call them technology and market differentiation/specialization), but they’ve become very apparent in the last 50 years with the advent of the computers and digital networked ecosystems that dominate all aspects of our lives. Early signs abound since the first digital network (the telegraph) was invented**, but we just haven’t realized it until now with a monopolized internet at global scale; albeit one that was intended to be free and open and is anything but. So, there exists NO accepted economic theory explaining or providing the answer to the problems of monopoly information networks that have been debated for well over 100 years when Theodore Vail promised “One Policy, One System, Universal Service” and the US government officially blessed information monopolies. "Equilibrism" may be THE answer that provides a means towards insuring universal access in competitive digital networked ecosystem. Equilibrism holds that settlements across and between the boundaries and layers are critical and that greater network effects occur the more interconnected the networks are down towards the bottom and edges of the ecosytems. Settlements serve two primary functions. First they are price signals. As such they provide incentives and disincentives between actors (remember the standard distribution between all the marginal actors referred to above?). Second they provide a mechanism for value conveyance between those who capture the value and those who bear the costs (remember the pareto distribution above?). In the informational stackas we’ve illustrated it, settlements exist north-south (between app and infrastructure layers) and east-west (between actors/networks). But a lack of these settlements has resulted in extreme misshaping of both the pareto optimum and normal distribution. We find very little academic work around settlements*** and, in particular, the proper level for achieving sustainability and generativity. 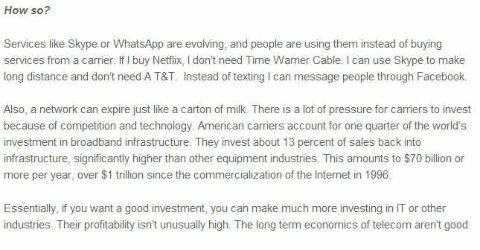 The internet is a “settlement free” model and therefore lacks incentives/disincentives and in the process makes risk one sided. Also without settlements, a receiving party cannot subsidize the sender (say goodbye to 800 like services which scaled the competitive voice WAN in the 1980s and 90s and paved the way for the internet to scale). Lastly, and much more importantly than the recent concerns over security, privacy and demagoguery, the internet does not facilitate universal service. Unlike the winner takes all model (the monopoly outcomes referred to above), equilibrism points to a new win/win model where supply and demand are cleared much more efficiently and the ecosystems are more sustainable and generative. So where universal service is seen as a “taking” or tax on those who have and giving to those who don’t and addressing only portions of the above 2 curves, equilibrism is fundamentally about “giving” to those who have albeit slightly less than those who don’t. Simply put equilibrism is at work when the larger actor pays a slightly higher settlement than the smaller actor, but in return the larger actor will still get a relatively larger benefit due to network effects. Think of it in gravity terms between 2 masses. We are somehow brainwashed into thinking winner takes all is a natural outcome. In fact it is not. Nature is about balance and evolution; a constant state of disequilibria striving for equilibrium. It’s not survival of the fittest; it’s about survival of the most adaptable. Almost invariably adaptation comes from the smaller actor or new entrant into the ecosystem. And that ultimately is what drives sustainability and advancement; not unfettered winner takes all competition. Change should be embraced, not rejected, because it is constantly occurring in nature. That’s how we need to begin to think about all our socio-economic and political institutions. This will take time, since it cuts against what we believe to be true since the dawn of mankind. If you don’t think so, take a refresher course in Plato’s Republic. If we don’t change our thinking and approach, at best digital and wealth divides will continue and we’ll convulse from within. At worst, outside forces, like technology (AI), other living organisms (contagions) and matter (climate change) will work against us in favor of balance. That’s just natural. The current debate over the state of America's broadband services and over the future of the internet is like a 3-ring circus or 3 different monarchists debating democracy. In other words an ironic and tragically humorous debate between monopolists, be they ultra-conservative capitalists, free-market libertarians, or statist liberals. Their conclusions do not provide a cogent path to solving the single biggest socio-political-economic issue of our time due to pre-existing biases, incorrect information, or incomplete/wanting analysis. Last week I wrote about Google's conflicts and paradoxes on this issue. Over the next few weeks I'll expand on this perspective, but today I'd like to respond to a Q&A, Debunking Broadband's Biggest Myths, posted on Commercial Observer, a NYC publication that deals with real estate issues mostly and has recently begun a section called Wired City, dealing with a wide array of issues confronting "a city's" #1 infrastructure challenge. Here's my debunking of the debunker. 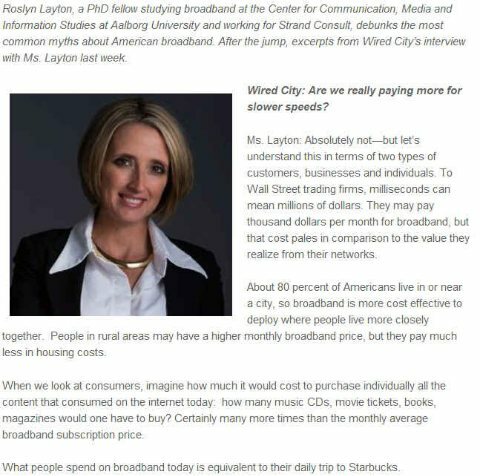 Real Reason/Answer: our bandwidth is 20-150x overpriced on a per bit basis because we disconnected from moore's and metcalfe's laws 10 years ago, due to the Telecom Act, then special access "de"regulation, then Brand-X or shutting down equal access for broadband. This rate differential is shown in the discrepancy between rates we pay in NYC and what Google charges in KC, as well as the difference in performance/price of 4G and wifi. It is great Roslyn can pay $3-5 a day for Starbucks. Most people can't (and shouldn't have to) just for a cup a Joe that you can make at home for 10-30 cents. Real Reason/Answer: Because of their vertical business models, carriers are not well positioned to generate high ROI on rapidly depreciating technology and inefficient operating expense at every layer of the "stack" across geographically or market segment constrained demand. This is the real legacy of inefficient monopoly regulation. Doing away with regulation, or deregulating the vertical monopoly, doesn’t work. Both the policy and the business model need to be approached differently. Blueprints exist from the 80s-90s that can help us restructure our inefficient service providers. Basically, any carrier that is granted a public ROW (right of way) or frequency should be held to an open access standard in layer 1. The quid pro quo is that end-points/end-users should also have equal or unhindered access to that network within (economic and aesthetic) reason. This simple regulatory fix solves 80% of the problem as network investments scale very rapidly, become pervasive, and can be depreciated quickly. 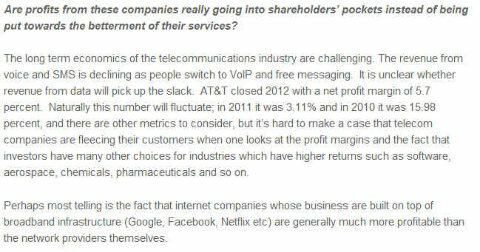 Real Reason/Answer: Quasi monopolies exist in video for the cable companies and in coverage/standards in frequencies for the wireless companies. These scale economies derived from pre-existing monopolies or duopolies granted by and maintained to a great degree by the government. The only open or equal access we have left from the 1980s-90s (the drivers that got us here) is wifi (802.11) which is a shared and reusable medium with the lowest cost/bit of any technology on the planet as a result. But other generative and scalabeable standards developed in the US or with US companies at the same time, just like the internet protocol stacks, including mobile OSs, 4G LTE (based on CDMA/OFDM technology), OpenStack/Flow that now rule the world. It's very important to distinguish which of these are truly open or not. 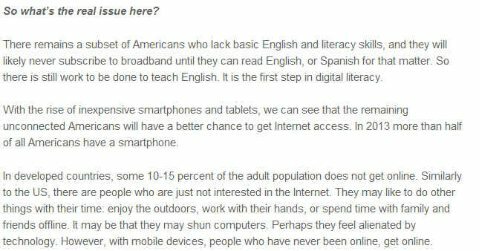 Real Reason/Answer: The 3rd of the population who don't have/use broadband is as much because of context and usability, whether community/ethnicity, age or income levels, as cost and awareness. If we had balanced settlements in the middle layers based on transaction fees and pricing which reflect competitive marginal cost, we could have corporate and centralized buyers subsidizing the access and making it freely available everywhere for everyone. Putting aside the ineffective debate between bill and keep and 2-sided pricing models and instead implementing balanced settlement exchange models will solve the problem of universal HD tele-work, education, health, government, etc… We learned in the 1980s-90s from 800 and internet advertising that competition can lead to free, universal access to digital "economies". This is the other 20% solution to the regulatory problem. Real Reason/Answer: The real issue here is that America led the digital information revolution prior to 1913 because it was a relatively open and competitive democracy, then took the world into 70 years of monopoly dark ages, finally breaking the shackles of monopoly in 1983, and then leading the modern information revolution through the 80s-90s. The US has now fallen behind in relative and absolute terms in the lower layers due to consolidation and remonopolization. Only the vestiges of pure competition from the 80s-90s, the horizontally scaled "data" and "content" companies like Apple, Google, Twitter and Netflix (and many, many more) are pulling us along. The vertical monopolies stifle innovation and the generative economic activity we saw in those 2 decades. The economic growth numbers and fiscal deficit do not lie.